This day marks our last glimpse of Singapore. 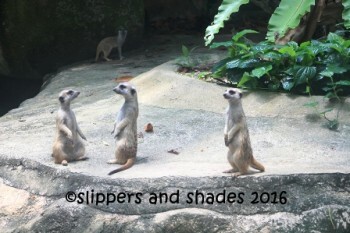 My brother (our generous provider hehehe) made us choose which of these zoos we like best to explore in our last day – River Safari, Jurong Bird Park, Night Safari or Singapore Zoo. Since we can’t decide which is which, he finally declared the latter. With his family who had been there once, we set off early so we can fully enjoy our one whole day family getaway. 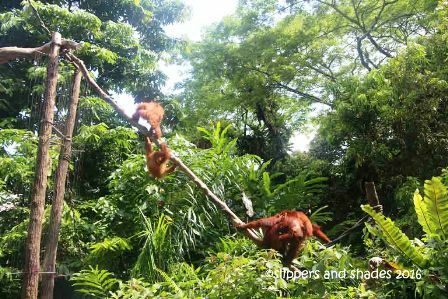 These four popular zoos by the way are managed and operated by Wildlife Reserves Singapore Group. 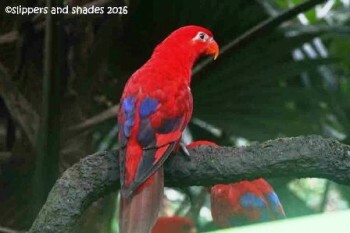 Singapore Zoo is commonly called Mandai Zoo by the locals. 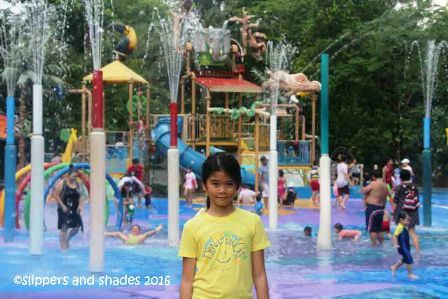 This award-winning zoo is situated in a sprawling 28 hectares in Mandai Lake Road. It has over 2,800 animals inhabiting the lush tropical rainforest and boasts of over 40 animal feeding sessions, kid’s playground, shows and best of all, it allows visitors to have an intimate encounter with the animals. Food and water are allowed inside. We brought packed lunched, crackers and bottled water. 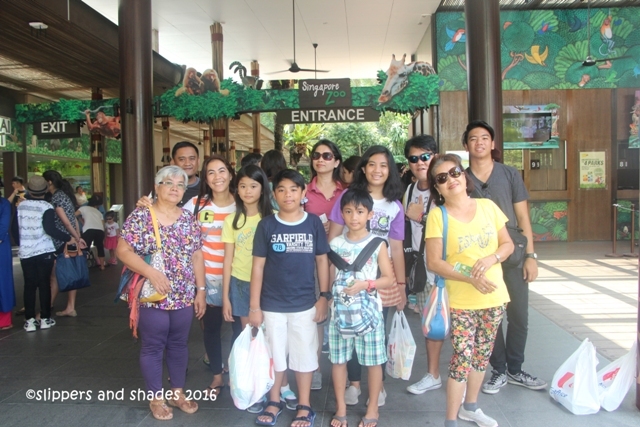 here’s our picture before we enter the zoo…smiling and excited! 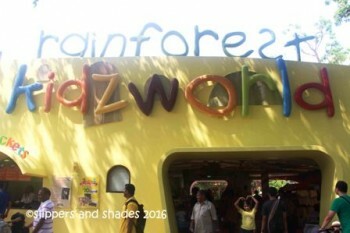 After we grabbed maps near the ticketing booth, we headed to the pathway going to Rainforest Walk. We were so delighted seeing the first animal we saw, the Proboscis Monkey. It was so up-close that we can actually shake hands with it. But visitors were not allowed to touch nor feed it. It was so lovable, so tame and so quiet while sitting on a branch of a tree. It seemed the cute little monkey was trained just to sit there while tourists were so elated waiting for their turns for a souvenir shot. what do you notice with these two pictures? 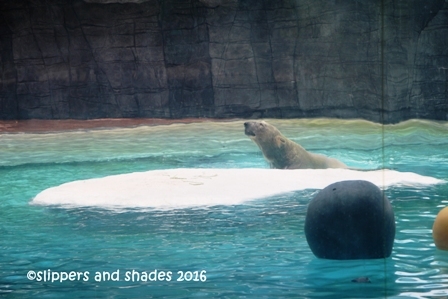 We waited for several minutes to see Inuca, the locally-born polar bear swims in a large glass-enclosed pool with giant ice blocks and waterfall. When the star of the show finally came out from the cave, we all rushed in the glass pool and watched it excitedly as it frolicked gracefully to the water. Frozen Tundra occupies a large area. Since our younger buddies were all famished, we ate our packed lunch here. After eating, the kids threw our wastes into the garbage bin. Bravo kids! Living in the wild. This zone brought us to Africa, the land of diverse culture and wildlife. Omar, the white tiger was the main attraction of Wild Africa. 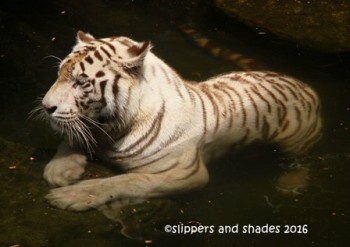 The time we went in, it was basking in the river with another white tiger, to the delight of the viewers. 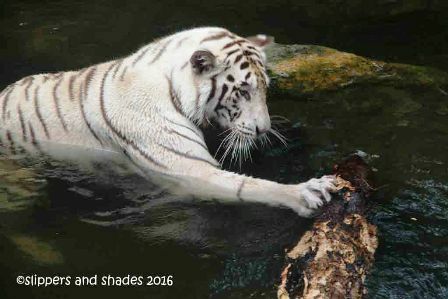 I was captivated seeing white tiger for the first time in Taiwan but it was only for few minutes because we were riding in an enclosed tour bus. Now, I enjoyed it fully seeing them much closer this time. Its white color fur, pink nose and blue eyes made white tigers so rare and beautiful. But of course beware, because tigers will attack for no reason at all! Another animals in this zone were Cheetah, African Lion, Zebra, Giraffe, African Painted Dog and White Rhinoceros. It was so awesome seeing Meerkats for the first time. They were standing upright on rocks with heads up and not moving for several minutes. And when they moved, they all ran and will stop with their heads up again. Funny creatures. In Cat Country, there were the Leopards and the Puma. 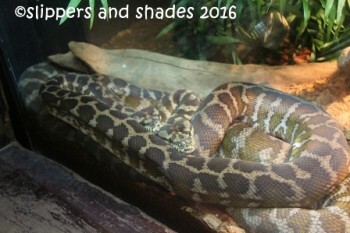 We entered the Snake House and saw various creepy legless reptiles inside their glass cages like the Rattlesnake, Reticulated Pythoon and Burmese Pythoon. Inside were also a fish pond with a big catfish and colored purple fish (sorry but I don’t know the name). There was a walk-through exhibit inside the Reptile Garden with a gentle reminder not touch or pick animals who were allowed to free range for they may bite. Animals found here were turtles and alligator. Rhino Iguana is so tame but scary because it definitely bites! 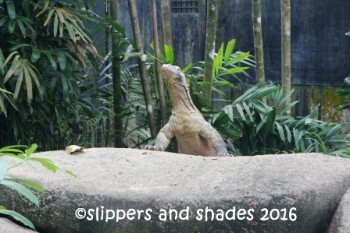 Kids were amazed to see the real-life dragon, the Komodo Dragon and the big Rhino Iguana. One of my favorite animals in a zoo is a tortoise because it was so tame and is safe for the kids even when they get close. We were so amazed, especially our young buddies watching several species with different shells and colors walking peacefully in their colony. 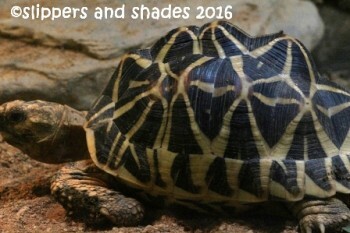 The beauty of Radiated Tortoise and Burmese Star Tortoise were so rare. I just love looking at them. But it saddened me knowing that these animals are being held captive for illegal pet trade which threaten its survival. They are now one of endangered species. I was thankful to the management and the team who were responsible for conserving and ensuring the safety of these species. I love this zone the most for bringing us in a real-like rich rain forest. Getting inside the massive biodome thrilled me more as we welcomed by a canopy of trees with flying butterflies, flying birds, ferns, shrubs, trees and a soothing sound of water cascade. 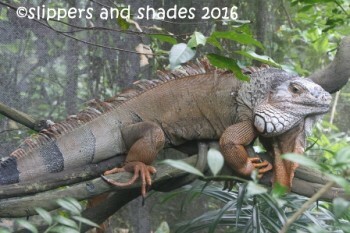 It was so amazing seeing crowned pigeons, lemurs and iguanas roaming freely. 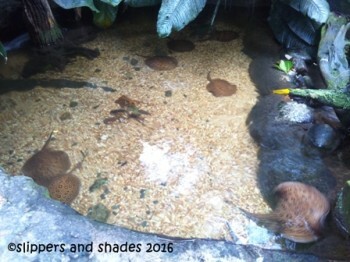 There was a swamp too with stingrays. And there were also frogs. We lazed around and ended up taking the wooden steps into the observation deck. 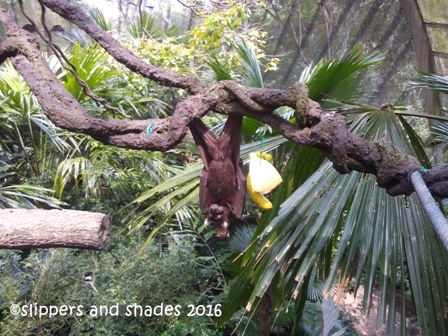 There were several Malayan Flying Fox on branches of trees, some were hovering in the air and some were eating fruits. 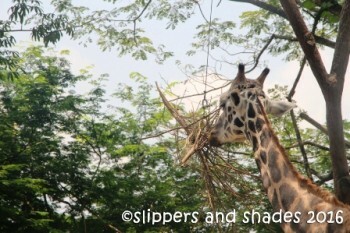 Other animals we saw were the ring-tailed lemur, two-toed sloth and the beautiful green and red lorries. Later there was a warning sound; maybe a snake had escaped from a cage. We evacuated the place at once to stay away from danger. But before we get out, we passed by Rafflesia Arnoldii, the world’s largest flower. 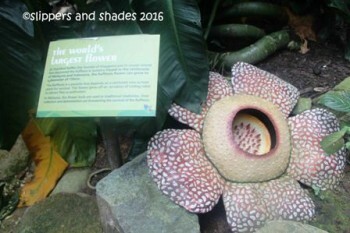 It was so fascinating seeing this flower in person. Our little buddies were so happy upon setting foot at Rainforest Kidsworld. It offers a lot of exciting activities for the kids to indulge with like the carousel ride, pony ride and splashing in a water play area. Another exciting activity to enjoy here is interacting with farmyard animals. We let the kids enjoyed momentarily the activities inside while we were looking for souvenir goodies and toys inside the Gift Shop. The fresh scent of lush forest and the sound of monkeys welcomed us as we entered the Primate Kingdom. The open cage concept of this zone brought us in a real jungle. We trekked the entire zone and was amazed to see each primate species having their own territories. We were entertained by these tree-dweller animals with their intelligence and tricks. Other Zones we skipped visiting due to lack of time were The Great Rift Valley of Ethiopia, Elephants of Asia, Tropical Crops & Orchid Garden and Treetop Trails. Indeed, one day is just enough to explore and visit all the zones, watch the shows and have a close encounter with the animals in their natural habitat. 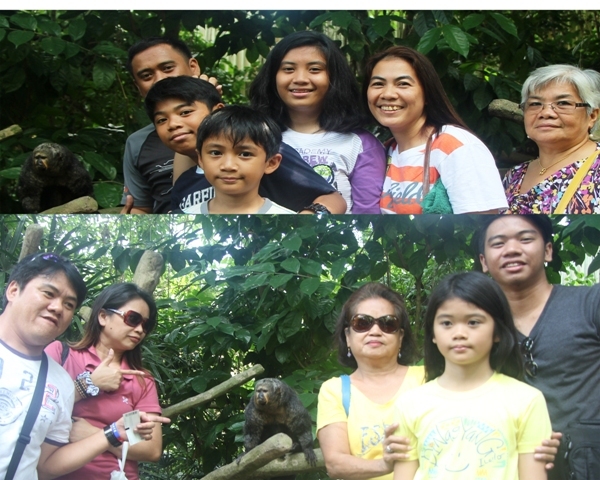 This day wasn’t only about seeing animals, how they eat and how they interact with people. It’s more than that. As for me and our little buddies; this day is all about appreciation, respect and understanding the animals in a much deeper level. The kids were fascinated seeing different animals in the environment they lived. They were curious of so many things and became sensitive of how to take care of each animal they encountered. We did not only enjoy roaming around, we were also educated a lot. Thanks to the reading posts in every zone, it added more wisdom. 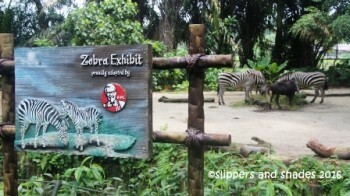 4 Parks for the price of 2: SG$69 save up to 50% with parkhopper. Tickets are valid for 7 days. Strollers, wagons, wheelchairs and lockers are available for rent on a first-come, first-served basis. *Only for children below 1.20m in height. Child must be present at the ticketing booth to purchase tickets. 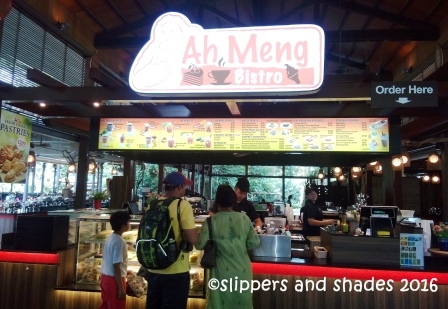 This entry was posted in Adventure, Archive, Articles, Singapore, Travel, Travel Archive, Vacation and tagged adventure, Ah Meng, Food, Mandai Zoo, nature, Outdoors, people, recreations, Singapore Zoo, vacation by shadesandslippers. Bookmark the permalink.